Ahhh springtime in Paris (Apropos for this day as I sit down to type out this recipe) …. or Bloomsburg, Pennsylvania… this day had me in the mood for a certain kind of salad. A “wilted lettuce” type of salad famous, for me, growing up with my blond hair blue eyed Pennsylvanian raised mother, and time spent in France enjoying the wonderfully comforting dish of Petits Pois à la Française. Petits Pois à la Française is comfort food found in many French bistros. Made with scallions, fresh peas, shredded lettuce, and a velvety volute chicken sauce is, next to Steak-Frites, definitely one of my “go-to’s” when dining familiar and “easy” in Paris. My mother is famous is my family and recently in the November/December 2016 issue of EdibleOKC Magazine for her Wilted Lettuce dish. A dish consisting of wilted iceberg lettuce with a creamy warm vinaigrette, it’s perfect for spring days and crisp autumn nights. Served over mashed potatoes and a garlicky-rosemaried pork roast, there is nothing better in my book for hearty Sunday Supper. Now, combining these two ideas for this warm spring day in the 405 was my goal… and I’m glad I did. Give it a shot! It’s an easy meal for two or as an elegant salad course for your next dinner party. I hope you enjoy! Depending on the heads of romaine that are available or you choose to use, trim any rough and spend butter leaves, the inedible base of the romaine head, and cut in half or quarters. If this salad is as a meal you may want larger “wedges”, or smaller if this is a salad course to a larger meal. Set aside. *If using “fresh” pearl onions, snip off the root end of each onion. Place into a small pot and cover with water and a pinch of kosher salt. Bring to a boil and remove from the heat. Drain the water and make an ice bath. Add the onions to the ice bath to soak. When the onions are cooled and able to be handled, pinch the onion from the printed end popping out a smooth round onion minus the outer layers. Dice your bacon into lardons, or thicker pieces. Remember as they cook and render done they will be smaller. Heat a frypan and render the bacon until crisp. Remove from the pan and drain any excess fat on a paper towel. Set aside the crispy bacon pieces and reserve three tablespoons of the leftover bacon drippings. Discard (or keep for another use) the rest of the drippings. Begin heating your outdoor or indoor grill. If you’re grilling other items either fro the salad like chicken or shrimp, or even steak as the main entree, it may be more efficient to use your outdoor grill. If this is a meal for two people, and indoor grill pan or grill may work best. You do you though, I’m just happy you’re cooking! Heat your grill, and spray lightly with cooking spray. Lay the romaine cut side down on your grill and cook 3-5 minutes… just long enough to lightly will and make grill marks. remove to a platter and start on your dressing. In the same frypan you used for the bacon add the 3 tablespoons of bacon drippings along with the white balsamic vinegar. Begin heating gently to almost poaching temperature (below a simmer). combine the heavy cream, paprika, and cook’s Line Seasoning and mix. Beat in the egg yolk, then gently pour and mix into the hot bacon and vinegar vinaigrette. Stir stir stir to heat and lightly thicken. Pour in the fresh green peas and the pearl onions, and gently toss to coat. 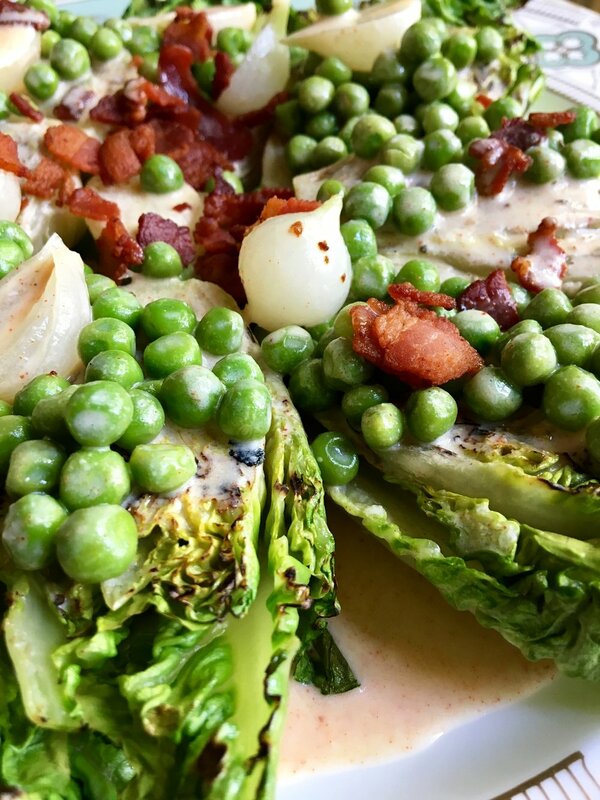 Pour the pea onion and creamy dressing over the grilled romaine. Garnish with the crispy bacon lardons, shaved Mimolette cheese or Parmesan. If you want a little more “substance” to your salad, add grilled chicken or shrimp. Enjoy!